The words “termite” and “pest” are almost always associated. Does it follow then that all termites are pests? If you answered yes, then the word “control” seem to naturally come to mind as you might want to keep the perceived problem at bay. No matter how apt the pest label is to termites that destroy structures, crops and objects important to man, there are many termite species that do not directly impact humans at all. In fact, only a small proportion of termite species have been labeled as pest. Majority contribute to the well being of the planet as a whole. How? Nutrient cycling is foremost in the list of benefits the planet derives from these tiny beasts. The same capability that made them “pests” is essential to the proper functioning of terrestrial ecosystems. Imagine what happens if dead tree trunks and plant refuse cannot be decomposed properly. Not only does the environment be littered with dead plant materials, but nutrients will be forever trapped in their bodies as well. Then life on earth as we know it would cease to exist. 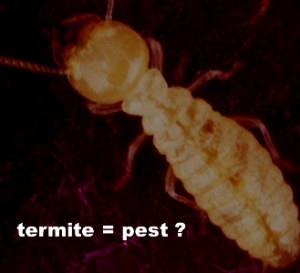 So, are all termites pests? No, not at all. Only those that negatively affect humans need to be controlled. Thus, it’s important to properly diagnose a pest problem, including confirming the species to avoid unnecessary expenditure of time, effort and money. Let the professionals do it… Bio-Tech Environmental Termite Control Team can.